Natural light streams in through a large window of the new Stewart and Lynda Resnick Neuropsychiatric Hospital at UCLA that looks out on the city below and the mountains beyond. A flat-screen TV, contemporary furnishings of blond wood and a comfortable sitting area give the space an attractive, modern feel. Outside, a fountain trickles gently in a Zen garden. “There is a very nice synergism be¬tween the best-in-the-West doctors and staff of our hospital and the most-advanced (psychiatric) physical plant in the world,” notes Dr. Thomas B. Strouse, medical director of Resnick Neuropsychiatric Hospital at UCLA. U.S.News & World Report consistently ranks Resnick Neuropsy¬chiatric Hospital at UCLA the best psychiatric facility in the western United States, and among the top-five in America, based largely on the quality of care. Until now, however, the physical setting was an¬other matter. Lighting in the old facility was poor, the floors scuffed and the furniture mismatched. A single room could be shared by as many as four patients. The new, bright and airy Resnick Neuropsychiatric Hospital at UCLA is all about caring for patients with dignity and compassion. The 74 patient rooms are spacious, and most are private. Nurses’ sta¬tions are open in a way that imparts a sense of community. 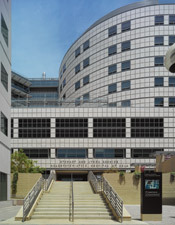 At 75,000 square feet, Resnick Neuropsychiatric Hospital at UCLA occupies most of the fourth floor of Ronald Reagan UCLA Medical Center, with its own entrance off of UCLA Medical Plaza. The hospital is divided into three pods that function like small neighborhoods and will go a long way toward giving patients “a better sense of well being,” notes Diane Moreau, director of nursing. Each pod can be programmed for various activities, depending on the needs of the patients. Instead of one large and chaotic dining commons, there are smaller and more intimate eating areas. Each pod has its own outdoor terrace, where patients can take advan¬tage of Southern California’s year-round sunshine for therapy, recreation or quiet time. Since its founding in 1960, Resnick Neuropsychiatric Hospital at UCLA has been a cornerstone of care for patients with mental-health, developmental and neurological disorders, from autism to eating disorders to schizophrenia. The hospital’s child-and-adolescent-care unit is the only such specialized medical program on the West Coast. The geriatrics unit was the first such facility in the United States, and is rated best by U.S.News. The autism program produces results that are so positive that the wait list for admission stretches to two years.